We all have important data on our computers, phones, and tablets. There’s photos of our family and friends, contact information, important documents, and much more. No matter how careful you are, it’s very easy to lose that data. Accidents and hardware failures happen, phones get lost, viruses and malware destroy (or ransom) your files, and disasters can occur. A few years ago, my husband and I almost lost all of our data. We came home one evening and found our front door open, the lock forced apart at some time during the day, and thieves had taken their pick of our belongings. Amongst the things missing were my husband’s MacBook and his iPad—along with all the documents and photos on them. Turns out we were lucky. After a visit from the police, and a few calls to our insurance company, most our stuff was replaced. But what about our data? Those photos were important memories! In the end, we were lucky—the thieves hadn’t taken our Apple Time Capsule (a WiFi access point and backup system) which had backed up our computers the night before. Once his new laptop arrived, my husband restored the data from the Time Capsule, and his Mac was back to how it was before the burglary. In its simplest form, a backup is a copy of your important files that you keep in case something happens to your original. There are lots of ways you can backup, but the simplest is to copy files to another format, like a CD, DVD, USB device, or external hard drive. As the NBN™ rolls out across Australia, bringing with it faster upload speeds, it’s becoming more popular to backup to online “cloud” services. Our unlimited data NBN™ plans mean you don’t have to worry about your backups consuming all of your data every month. In practice, you could have one copy on your laptop, one on an external drive, and a third copy on an online cloud backup system. Then you’ve got a local backup handy if you need to restore something quickly. 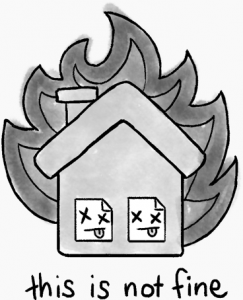 Plus, if something really bad happens—like a fire, theft, or flood—you’ve still got another copy offsite in the cloud backup. Remember my break-in story? We had two copies, but we didn’t have a third (offsite) copy. We’re just very lucky that the thieves didn’t take our Time Capsule as well. We think it helped that our backup wasn’t kept near any of our computers—as a thief will usually take everything that’s nearby and easy to grab! So, how do you backup? Following the 3-2-1 strategy, you’ll want at least a local backup, and an offsite backup. 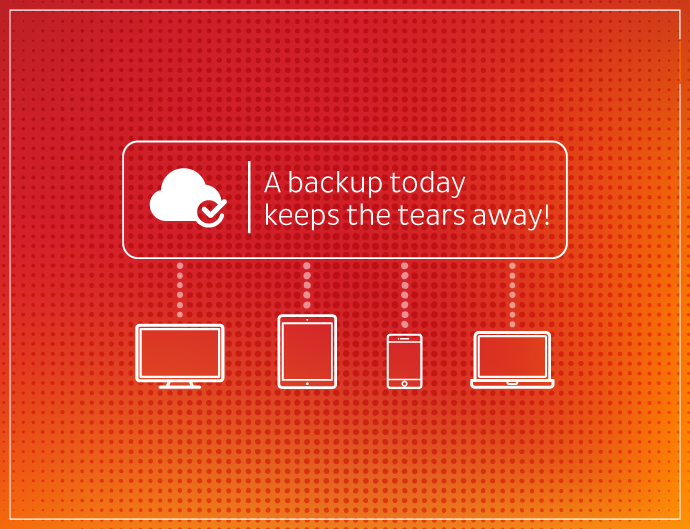 If you can’t do both, pick an offsite backup so you’re covered in a worst-case scenario. For your local backup, you’ll need an external hard drive that’s as big as the internal drive in your computer. If you can afford it (and storage is getting cheaper these days), try to get one that’s 2–4 times that size. The easiest way to do an offsite backup is through a cloud based backup system, and PCMag has an excellent comparison article to help you choose. For a monthly (or annual) fee, these services will backup your files to their servers over your broadband. Some services also have tools to automate your local backups. If cost is a concern, some services (like CrashPlan) even let you use your broadband to back up to your friends or family’s houses. And finally, don’t forget your phones! If you have an iPhone, you can backup to iCloud, and it’s a good idea to occasionally backup to iTunes on your computer, too (this way, your computer’s backups will also backup your phone). Android users can use Google Sync to back up, and again it’s worth occasionally connecting your phone to your computer and copying files over. If you already backup, can you remember the last time you tested your backups? I backup regularly, and always have done so, now however I backup to to 2 devices,1 is a hard drive that is constantly connected to my comp the other is an external hard drive which I unplug once I have backed up to it. I back up to the 2nd drive once a week. I have not too fond memories of formatting my computer after I had problems only to find windows in its infinite wisdom had formatted both the hard drives without actually asking if I wanted either formatting. I lost every thing.